Whether we choose to or not, our businesses are undergoing a rapid digital transformation. To ride this technology wave successfully, we need a modern IT infrastructure. At the heart of this modern IT infrastructure is the server. Choosing the right server that fits both the current and future needs is critical. PowerEdge is introducing its new line of award-winning servers that is custom-built for the modern IT infrastructure. Since business face fierce competition and dynamic customer needs, the Scalable Business Architecture from PowerEdge enables an enterprise to scale efficiently and adapt quickly to address this dynamic business & workload needs. 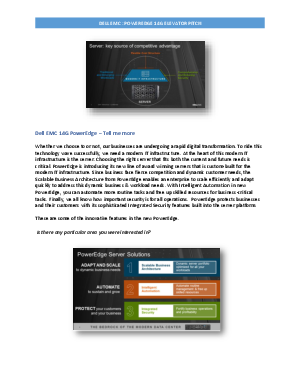 With Intelligent Automation in new PowerEdge, you can automate more routine tasks and free up skilled resources for business-critical tasks. Finally, we all know how important security is for all operations. PowerEdge protects businesses and their customers with its sophisticated Integrated Security features built into the server platform.